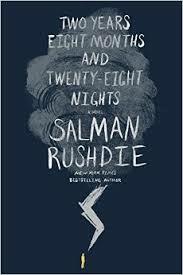 I really enjoy some of Salman Rushdie’s works, The Satanic Verses is one of my favorite novels of all time. On the other hand I have a hard time appreciating books like Fury. So let’s just say his work is uneven. But with Two Years Eight Months and Twenty-Eight Nights he’s upping my running score on him in favor of more likes than dislikes. This time the story is heavy on magical realism with emphasis on the magical – but it displays Rushdie’s fierce sense of humor, his usual idea that “we are all mongrels” and skillful story-telling. This is the same Salman Rushdie who wrote Midnight’s Children, the winner of 1981 Booker Prize, the “Booker of Bookers” (1993) and “Best of Bookers” (2008). Only with The Satanic Verses has he ever since come close to that brilliance. The “plot” – okay – back in the 12th century (or so) this Andalusian Ibn Rush and Dunia the jinn, started an affair. The completely fictional Dunia who has fallen out of and escaped from “fairyland” (a concept/place in medieval folktales aka Peristan) is different from most jin/jinnia in that she actually managed to fall in love with a human, Ibn Rushd. The human and the jinn hadmany children – dozens of children. A distinguishing trait of these offspring is that the ears are lobeless. But at some point Dunia had to slip back into Fairyland/Peristan before the little gap closed. Later the whole curtain between us and Jinnieland opened up again and therein lies the tale. In the current time, more or less, a horrible storm hits the world and life as we know it ends (dystopian fiction here). This introduces an “age of the irrational” generally known as “the time of strangenesses.” Just prior to the storm a landscaping man named Geronimo (who is from India and has his own history) found himself levitating (yes) and then a beautiful billionaire princess, invited him into her bedroom. Backing up again to the 12th or 13th century Ibn Rushd had an enemy due to his philosophy of reason and the idea that religion will shrivel up. Gazali of Tus saw Ibn Rushd’s teachings as blasphemous insisting that faith alone allows humans to live on earth and will until God comes and destroys said earth. But Ibn Rushd says that it would be a cruel god to destroy his own creation and he doesn’t believe in that. There are other stories about paranormal activity after the storm – Jimmy Kapoor creates a graphic novel with a protagonist whose superpower is dancing – Natraj comes to life. There’s an abandoned baby wrapped in an India flag, who can detect lies and corruption and there’s a struggling young cellist who is offered a million pounds to disappear from the life of his wife. That’s just the surface of the first part of the story – (no spoilers). It gets far more complex and hard to follow as the stories pile up – both on the physical earth and in Fairyland/Peristan. For what it’s worth, Ibn Rushd is not our author and the name is never really used as a play on the author’s name. Rushdie has said elsewhere that his own father claimed a family connection. Ibn Rushd- Averros Abu al-Walid Muhammad ibn Ahmad ibn Rushd, better known in the Latin West as Averroes, lived during a unique period in Western intellectual history, in which interest in philosophy and theology was waning in the Muslim world and just beginning to flourish in Latin Christendom. Ghazali – Abū Ḥāmid Muḥammad ibn Muḥammad al-Ghazālī (/ɡæˈzɑːli/; Arabic: ابو حامد محمد ابن محمد الغزالي‎; c. 1058–1111), known as Al-Ghazali or Algazel to the Western medieval world, was a Muslim theologian, jurist, philosopher, and mystic of Persian descent. It’s amazing isn’t? All those elements: allegory, dystopia, fairytale, myth – I bet there were even allusions to the Koran but since I haven’t read it, I would have missed them. What do you do while you’re listening to books? Ach – I do chores around the house like chop celery and pull weeds. I sit at my computer and play a mindless game – many “wasted” hours listening to books and playing Mahjong. I listen when I drive very far at all – I started out taking walks and listening then I just didn’t put the iPod away and kept doing something. It’s addictive.